If there’s one thing that SaraKay Smullens believes, it’s that caring for others should not come at the expense of caring for oneself. 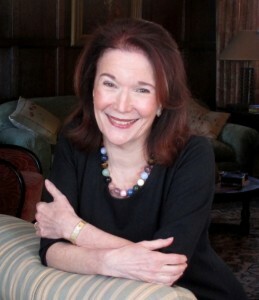 In her new book, Burnout and Self-Care in Social Work: A Guidebook for Students and Those in Mental Health and Related Professions, published by NASW Press, Smullens uses research, case studies, and her extensive personal experience to help social workers increase their personal and professional satisfaction. Q: Describe your journey to the social work profession. Smullens: During the beginning of the Civil Rights Movement and the infancy of the Woman’s Movement, I became inspired by the presidential candidacy of Senator John F. Kennedy. During my sophomore year of college, I wrote to every Democratic political leader in Maryland I had ever read about. I expressed my admiration for Senator Kennedy and asked to work at the 1960 Democratic Convention in Los Angeles. All of my letters were forwarded to Dr. Mildred Otenasek, the Maryland National Committeewoman, who interviewed me and appointed me a page to the delegation. Dr. Otenasek (who also became a friend and mentor) introduced me to Senator Kennedy in Los Angeles. He told me that if he won, I should be in touch with his secretary, Evelyn Lincoln. During a campaign stop in Baltimore, he remembered me and reminded me to make the call. Following his election, I was given a job at the Democratic National Committee (DNC) as one of the regional coordinators of the Young Democrats. It was during this time that President Kennedy told me about the profession of social work, and urged me to be in touch with the excellent school at Catholic University, the National Catholic School of Social Service. I was accepted into this program with a full scholarship. I was a student in this program when the President was assassinated. Soon after, I married a student at the University of Pennsylvania Law School (the marriage lasted for 13 years) and transferred to UPenn’s School of Social Work (now called the School of Social Policy and Practice). When divorce became necessary in my life, it was also necessary to leave my social work job that paid $7,200 a year. In order to pay for my legal expenses and necessary therapy, I developed a private practice. When Lynne Abraham became Philadelphia’s District Attorney in 1991 (an office she held until 2005), she began to refer clients involved in domestic violence who were first-time offenders to me. I did this pro bono work (among other initiatives, agency work, and writing projects) for over two decades. Q: What inspired you to write Burnout and Self-Care in Social Work? How did you conduct the research for this project? Smullens: I have been very blessed in my life, and there are more years behind me than ahead of me. I wanted to give something to my colleagues that I know to be true and that could hopefully be meaningful to them. I like nothing more than sharing with colleagues new to our work, and I try always to be available to them. This was the strongest motivation for my book. Throughout my career, I have seen committed, highly trained, and experienced social workers leave our field due to burnout. Without their expert supervision, young, passionate, and caring social workers also left. I also saw horrible things happen to our vulnerable children. I believed then and now that the incidents of death and suffering would have been lessened if more trained social workers and those in related fields were available to work with our neediest families. I became deeply determined to do something about this. I began to offer workshops in the areas of burnout and self-care, and to write about these challenges. One paper, “What I Wish I Had Known: Burnout and Self-Care in Our Social Work Profession,” published in The New Social Worker, won the NASW media award in the magazine category, as did the magazine itself. After I received that honor, NASW Press reached out to me. There has also been a qualitative case study I have conducted over the past two years: drawing from over 200 prospective candidates, 40 social workers were selected to complete an anonymous, extensive questionnaire. Their responses pointed to the exact problems of burnout and blessings of self-care in a unique way, and because of their efforts, we are able to hear authentic voices of those on the front lines of social work and mental health practice. In addition, there are the case studies of individuals (with identifying features altered) whose stories I have known intimately through my 30-plus years of social work and who aptly represent the tremendous challenges of burnout and the very real possibilities of self-care. Finally, there are questions at the conclusion of most chapters, designed for personal examination and understanding. It may be that these opportunities for reflection will also have value to those important to you, either in social work and related professions, or not. Hopefully, new areas of self-awareness can lead to clearer individualized direction as well as more meaningful and fulfilling sharing and communication with others. Authentic, trusting contact is a gift synonymous with self-care. Q: Why do you think burnout is such a common experience in social work and related professions? Smullens: As I explain in my book, we see situations that are so overwhelming. We work with individual, couple, and family problems involving intimacy, communication, and control issues, and the challenges of dealing with frustration, anger and rage. In addition, we work with a population that has not been offered the opportunities and advantages that so many of us take for granted. When you grow up in a hopeless state, it is so much harder to see a light at the end of the tunnel, or, as I put it, “develop an emotional sense of direction” that allows education, opportunity, and sustaining expressions of love and intimacy to become part of your world. Clinicians in most mental health professions address internal problems, relationship conflicts, and self-defeating attitudes and behaviors. Yet, unlike social workers and those who share related employment, most are not confronted with the underbelly of the real world in their day-to-day work. We, however, day in and day out, come face-to-face with abuse of every kind, often in the very settings in which they occur—abuse compounded by poverty, hopelessness, and hunger. Q: Have you encountered any common misconceptions about burnout and self-care in your research for this book? Smullens: Oh, yes I have seen misconceptions. But the misconceptions have not come primarily from the research, but from others who understandably cannot know what we see or its toll. How do we talk about a child used as a human ashtray, a bug infested home, or a child who sleeps on a chair and believes that a chair is a bed? The realities of our work are very hard to describe to others and also very hard for many to hear about – and often we are too tired to even try. As a result, most have no idea of the demands of our work, or understanding that some days are so hard, we have nothing left to give to anyone. However, in my opinion, the existing literature has not offered concentration on the Self in self-care. I’ve tried to provide that. My book notes evidenced-based self-care strategies. However, the importance that each of us designs a self-care approach that is individualized and personally appealing is stressed. Also stressed, with examples, are opportunities to think creatively outside of the box and give oneself permission to have fun in our self-care selections. Q: Have you ever personally experienced feelings of burnout in your career? Would you mind telling us when? Smullens: Of course. It is impossible not to, unless we involve a self-care regiment in our lives and become determined to stick to it, regardless of our endless personal and professional responsibilities. The reality is that social workers do not receive the respect we deserve, which is reflected in our salaries. This inequity must be addressed. Our training is difficult and expensive, and once we receive our degree, there is still so much to continue to learn. In fact, we spend a lifetime learning about the complexities of the human condition and how to address this as wisely, caringly, and effectively as possible in a society that can be so callous toward our most vulnerable families. Personally, my most debilitating experience with burnout occurred when I was in my first marriage. Divorce was absolutely necessary, but I did not want to face it. I had two very young children and was terrified by the responsibilities of caring for them alone. My daughters were 4 and 7 when I finally made the decision to separate and begin working toward a divorce in a state where the divorce laws, at the time, were brutal: no alimony, no “no fault” divorce, and no equitable division of marital property. To say that I was terrified is an understatement. But that terror helped me to truly understand the terror of so many of my clients. In like manner, every ordeal and challenge of my life has helped me to better understand my clients. Q: In Burnout and Self-Care in Social Work, you outline many simple ways that social workers can practice self-care. What is your personal self-care regimen? Smullens: In truth, I do not see them as simple ways. Social workers live with exceedingly difficult professional realities, and although the evidenced based opportunities for self-care are clearly delineated in my book, it is never simple to make this promise to ourselves. Sometimes we are just too tired. But we must, and once we get used to doing this, it does become part of our day to day life. For my husband and me, continued work at communicating well and showing each other how appreciative we are of our relationship is an essential part of our self-care. Also, my continued relationship with my daughters, sons, and grandchildren is very important to me. It is also essential to carve out time for good friends. Laughter, fun, and relaxation in these relationships are essential. As I shared above, I received therapy while going through my divorce. When necessary, I still receive consultation. Usually this involves a client who seems stuck in his or her own repeated painful choices and unable to move toward a more positive direction and framing of challenges. It also may involve clients who are touching parts of my own life that require further examination and understanding. Another mainstay is writing. As I share in our book, journaling led to my first book, and I continue to find this expression essential. I also attend conferences whenever possible, and some of these extremely important experiences with other social workers and mental health professionals are noted in the acknowledgments of my book. Advocacy and activism are other components of my self-care. There is also the relaxation of my time alone at a movie with a quality cup of coffee or tea and an oatmeal raison cookie! Q: What do you hope readers will take away from Burnout and Self-Care in Social Work? Q: What advice would you give to those entering social work or related professions? Smullens: The effectiveness of our work depends on our quality of self-awareness and self-care, our understanding of and respect for boundaries, and our knowledge of the importance of empathy and its relationship to compassion. With these insights, everything is possible for our clients, our profession, and our Selves. And there is one more thing: Despite all of the obstacles there is no more essential or potentially fulfilling profession than social work. Click here to purchase Burnout and Self-Care in Social Work. For more information about publishing with NASW Press, please contact Stella Donovan, Acquisitions Editor, at sdonovan@naswdc.org. SaraKay Smullens, LCSW, ACSW, BCD, CGP, CFLE, whose private and pro bono clinical social work practice is in Philadelphia, is a certified group psychotherapist and family life educator. She is a recipient of a Lifetime Achievement Award from NASW-PA, which recognized her long-standing community organization, advocacy, and activism, as well as the codification of patterns of emotional abuse and the development of a therapeutic model to address it. SaraKay is the founder of the Philadelphia initiative The Sabbath of Domestic Peace, which identified clergy as a “missing link” in addressing domestic violence, devoting itself to clergy involvement and education that prayer alone would not save lives and that couples in distress, due to abuse and violence, could not be seen together. SaraKay has published in peer-reviewed journals, is the best-selling author ofWhoever Said Life Is Fair? : A Guide to Growing Through Life’s Injustices andSetting YourSelf Free: Breaking the Cycle of Emotional Abuse in Family, Friendships, Work, and Love, and blogs for The Huffington Post. Her professional papers and memorabilia are divided between the Archives of the University of Pennsylvania, Goucher College, and the John F. Kennedy Presidential Library. SaraKay’s professional life continues to be devoted to highlighting destructive societal forces through education, advocacy, and activism. Thank you for all that you have been though and done for us newly BSW. I’m grateful to read you message and gain some insight about how to care for ones self. Things that make our profession dearing. I’ll continue to seek energy to be able to do a better job working with others. Thank you for your responses. I so hope that young professional, such as you, Bobby, will find meaning in this book. I have tried to put as much important information I could to ease stress, both evidence based and from my experience of over thirty years as a social worker. Aletta, there is also emphasis on employee responsibilities to social workers and dealing with those settings were these responsibilities are not met. I am practicing social worker in the Phillipines and currently undertaking a Master’s Degree in Social Work with self-care as my focus. I have cited your work as one of my references in my literature. I would like to know if there is a tool that I can obtain from you to determine the extent of use of self care among helping professionals. Thank you very much! Thanks for contacting us. I would suggest you email Ms. Smullens directly at SaraKay1710@gmail.com to have your questions answered. 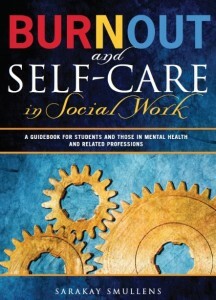 Am glad to have the opportunity to know about BURN OUT AND SELF_CARE IN SOCIAL WORK. I strongly hope that this book will assist us the young social worker in view in developing country like Nigeria to over come stressors associated with our daily practice and bring more professionalism to meeting clients needs.